Two of 2011’s hottest poker players met in a heads-up battle in Event #5, a $1,500 Seven-Card-Stud tournament at the World Series of Poker as Eugene Katchalov and Alessio Isaia squared off on the final day of the tournament. In the end it was Katchalov who would prevail over the Italian, earning his first WSOP bracelet and adding over $122k in winnings to his career totals. 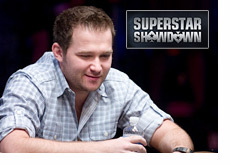 Katchalov’s 2011 tournament campaign started with a huge win at the $100k Super-High-Roller tournament at the PCA, followed by two runner-up finishes in $10k High-Roller events, as well as cashes in the PCA Main Event and EPT Grand Final in Madrid. Katchalov now has over $6.3 million in career tournament earnings, and is closing in on $2 million in earnings in 2011 alone according to thehendonmob.com. Katchalov is also two-thirds of the way to the Triple Crown as the newly crowned bracelet winner also has a WPT title on his resume. Isaia was running just as good as Katchalov in 2011 considering he chopped the FTOPS XIX Heads-Up Championship, won the WPT Venice Main Event, and final tabled the WPT Vienna Main Event, the Everest Poker ONE, and the IPT Malta Main Event. This entry was posted on Sunday, June 5th, 2011 at 8:40 am and is filed under Poker News. You can follow any responses to this entry through the RSS 2.0 feed. You can leave a response, or trackback from your own site.